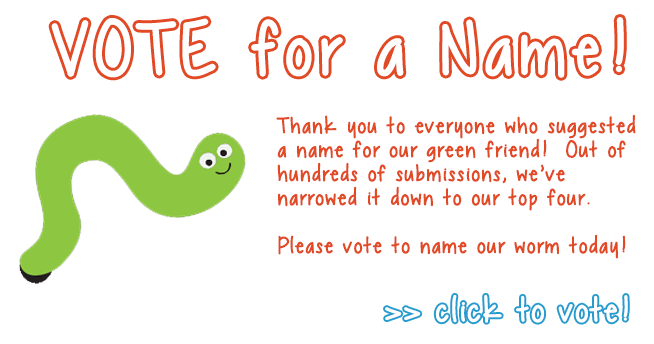 VOTE to Name Our Worm! Thank you to everyone who participated last week in suggesting a name for our worm! We had a blast reading through all the wonderfully quirky and creative suggestions. Out of hundreds of submissions, we’ve narrowed down the choices to our top 4, and now we’d like for YOU to vote on the best name! Cast your vote here! Results of the poll will be shared next week, so don’t forget to check back here or our Facebook page. Written by: Different Roads to Learning on May 21, 2014. This entry was posted in ABA and tagged Different Roads to Learning, Just for Fun, Name that Worm, Social Campaigns by Different Roads to Learning. Bookmark the permalink.